Recently a good friend of mine lost her nephew, Martin Anthony Piñon, to Leukemia; he was only 17 years old. Although I never got a chance to meet him, I have heard about the great spirit, strength, and courage he had in the midst of fighting his battle. It’s never a happy time when a loved one passes but for some reason, it’s in these moments that people (even strangers) are often united. 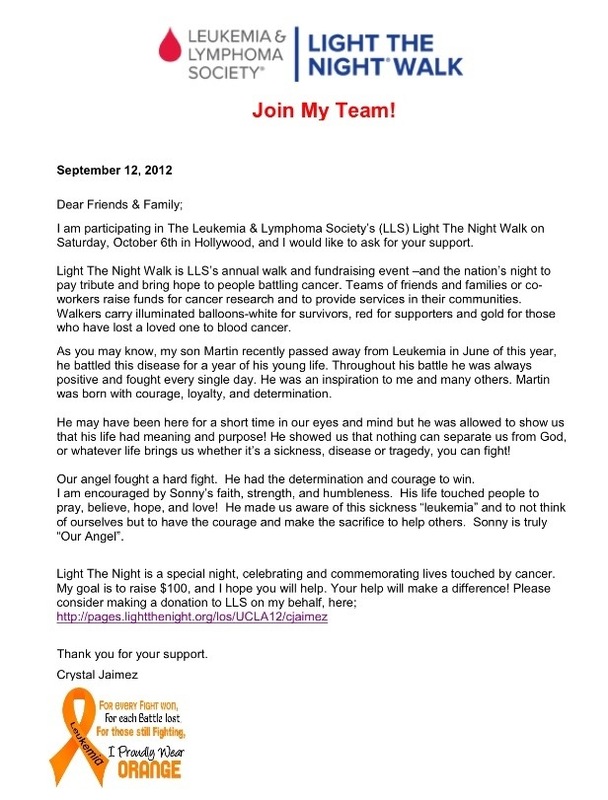 So that’s why I’m reaching out to my blog community for support in helping Crystal (Martin’s mother) raise $100 for The Leukemia & Lymphoma Society’s Light The Night Walk. If you would like to donate and are able to, please click here, no amount is too small to help save a precious life. Thank u so much for posting this. Martin (“Sonny”) was such an inspiration to us. The Lord blessed our family by allowing us to see such strength and courage. He will be greatly missed but we thank God for the 17 years we had him and look forward to seeing him again one day in heaven.